Everybody's real estate journey is a unique one, and it's our goal to make it as pleasant and worry-free as possible. Welcome to my page. It's designed to make your Search as easy as a few clicks. 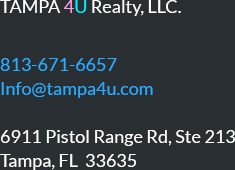 Up-to-date, Complete MLS database featuring all properties for sale in Tampa Bay area which includes Hillsborough, Pinellas and Pasco counties. Here, you will also find information about the area and most commonly asked questions and answers about real estate process. Tampa Bay and Gulf areas are known for their variety of luxury real estate choices - traditional, modern or contemporary residences in breathtaking locations: ocean waterfronts, beachsides, lakefronts, bayfronts, golf lands, nature preserves, historic districts, downtown high-rises, and other gorgeous places around Hillsborough, Pasco and Pinellas counties. Customer satisfaction is the key to a successful real estate business. My team and I, pride ourselves in giving exceptional, discreet and honest service. With Julia and her team as your partner, you tap into their extensive knowledge and resources. They present you only the most relevant and important information, thereby making finding your dream home simple.